Go into any hospital or medical facility and you will hear lots of beeping, humming, and chirping noises. That's the sound of all the equipment being used to monitor patients' vital signs, look for diseases or injuries, and keep bodies doing what bodies are supposed to do. When any piece of this equipment ceases to function, a biomedical equipment technician is the professional who fixes it. Also called a medical equipment repairer, he or she may work on equipment that is as simple as an electric wheelchair, or as sophisticated as a CAT scanner, depending on his or her training and experience. He or she is indispensable to any healthcare facility as it is this person who keeps patient monitors, diagnostic equipment, voice-controlled operating tables, wheelchairs, and gurneys functioning. A biomedical equipment technician, in addition to making repairs, also performs regular maintenance to ensure that equipment continues to operate correctly. Biomedical equipment technicians earn a median annual salary of $48,820 (2017). Approximately 47,100 people work in this occupation (2016). 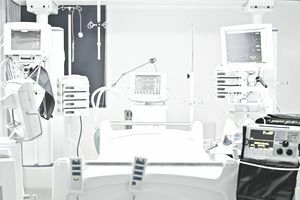 Companies that supply equipment to hospitals and healthcare facilities employ well over a quarter of them. Many also work for hospitals and equipment repair and maintenance companies. The job outlook for this occupation is mediocre. According to the Bureau of Labor Statistics, employment is expected to grow more slowly than the average for all occupations between 2016 and 2026. "Perform repairs and calibrations to most Diagnostic and Therapeutic Medical Equipment and maintain associated records"
"Diagnose and correct system and equipment malfunctions"
"Log new devices into computer inventory database upon receipt and inspection"
"Solve organization-level customer service issues and complaints"
"Report all patient safety issues to supervisor or manager and assist with correction of issue as required"
"Participate in pre-purchase evaluation programs"
"Assist in identifying and recommending replacement of equipment that is obsolete, has extensive repair history, or has identified safety issues"
Individuals who work in this field typically have an associate degree in biomedical equipment technology, electronics, or engineering. Less complicated work generally requires only on-the-job training, while more sophisticated work may warrant a bachelor's degree. One may also need a bachelor's degree for a job with more responsibility. Another way to gain entry into this field is to get training from the armed forces. Someone who is new to this field will spend a few months working under the supervision of an experienced biomedical equipment technician before he or she is deemed ready to work independently. The training doesn't stop there, however. As technology advances and new equipment is developed, biomedical equipment technicians must constantly keep up with these changes. They do this by attending seminars and engaging in self-study. The Association for the Advancement of Medical Instrumentation (AAMI) offers certification to biomedical equipment technicians who desire it. Becoming certified isn't required, but it can make someone a more desirable job candidate. Those who want to move into supervisory roles may need to become certified. AAMI offers the following certifications: Certified Biomedical Equipment Technician (CBET), Certified Laboratory Equipment Specialist (CLEB), and Certified Radiology Equipment Specialist (CRES). Requirements for getting these credentials include earning an associate degree or completing training in the armed forces and then working for two to three years. Candidates must take and pass an exam. Many employers will pay for certification. Dexterity: This is the ability to coordinate your fingers and hands to pick up and manipulate small objects. Excellent eye-hand coordination is also required. Stamina: When working on equipment you must be able to stand for long periods and contort yourself into awkward positions. Time Management: The ability to prioritize tasks will allow you to manage a heavy workload. Problem Solving: You must be able to troubleshoot the source of problems and come up with solutions. Communication: Excellent writing, listening, and speaking skills are essential for receiving information from and conveying it to clients and colleagues. What Else Will Employers Expect From You? "Must be self-disciplined, able to work with minimal supervision and manage time efficiently"
"Maintain a high standard of customer service"
"Adaptable in your approach and demeanor in real time to match the shifting demands of different situations"
"Working knowledge of e-mail, database management, spreadsheet, and word processor applications"
"Ability to work a flexible schedule including nights, weekends, and holidays"
An occupation is more likely to be suitable for you if it matches your interests, personality type, and work-related values. Biomedical equipment technicians need the following traits. Do a self assessment to help you discover if you have them. Sources: Bureau of Labor Statistics, U.S. Department of Labor, Occupational Outlook Handbook; Employment and Training Administration, U.S. Department of Labor, O*NET Online (visited August 14, 2018).